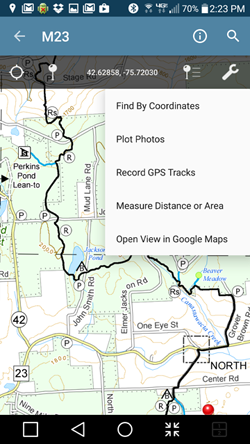 Here are three hikes involving the new Lithuanian Loop Trail. See FLTC map M19. 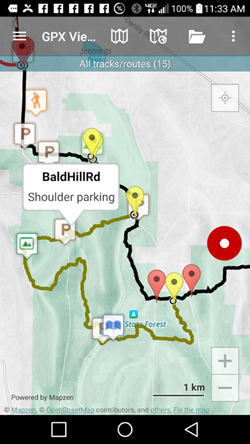 The LLT trailhead is easy to spot off Babcock Hollow Road at the large parking area near the big ponds there, 0.4 mile north of the FLT crossing. This yellow-blazed trail, which starts across the road from the parking area, is marked by triple blazes and a laminated sign that distinguishes the eastern and western sections. Be sure to lock your car and leave no valuables in sight. To hike this loop, the recommended direction is to begin with the western section, which bears right almost immediately. The path begins to ascend gradually through hardwoods, crossing a couple of seasonal streams and springs and passing a comfortable stone seat with backrest at the base of one of the hillside’s rare evergreen trees. Not long after, the LLT reaches its first junction with the FLT. Turn left, now following both yellow and white blazes as the LLT and FLT now are running concurrently. After a little over a tenth of a mile uphill, the trails diverge, with the LLT’s eastern section veering off to the left and soon reaching the LLT’s register box. Please do sign in. Now begins a delightful, level stroll for about three tenths of a mile on a path that gradually widens until it becomes a pretty, old logging road. The trail passes several branch logging roads, but the LLT proceeds straight through at all such junctions. Eventually the LLT begins to drop downhill, somewhat steeply at times, until it enters a beautiful, dark, Norway spruce forest. A double blaze on the left indicates the point at which the trail leaves the logging road and enters the spruces. Descend through the spruces on switchbacks and eventually enter a red-pine forest. Soon reach the junction with the western section and the original parking lot by the ponds, which in winter can be seen through the trees as one descends. The ponds are particularly pretty, and the patient observer may even see a beaver or two at work. The beavers’ lodge is located in the next pond, north of the parking area. This hike is particularly attractive if the weather should be unsettled, since it passes by Foxfire Lean-To twice, where excellent shelter is available. Take the western section of the LLT till you hit the FLT. Turn left and head uphill, passing by the eastern section of the LLT, which will be your return route. Keep on the white-blazed FLT all the way past Foxfire Lean-To and past the terminus of the orange-blazed Dabes Diversion Trail. 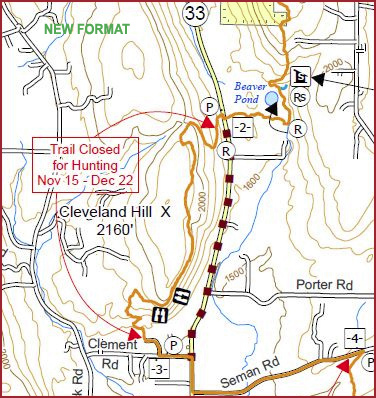 Cross Bleck Road and soon locate the blue-blazed Kuzia Cutoff Trail, where you should turn left and go all the way to the Dabes Diversion Trail, which is running along Hauck Hill Road. Turn left again and follow the orange blazes across Bleck Road and back to the FLT. Turn right on the white blazes and go past Foxfire Lean-To again to the eastern end of the Lithuanian Loop. Turn right on the yellow blazes and follow them all the way back to your car. Anyone going to Foxfire Lean-To who wants to avoid dirt-road driving can use the LLT to get to the lean-to. Other access points, such as lower Bleck Road, Cortright Road, or Kells Road, involve dirt-road driving. This hike extends the 7.2-mile International Loop, which includes the FLT (American), Swedish Loop, and Spanish Loop, and now brings in the Lithuanian Loop. It is a fairly strenuous hike, and one with many twists and turns, but it leads to many scenic rewards. 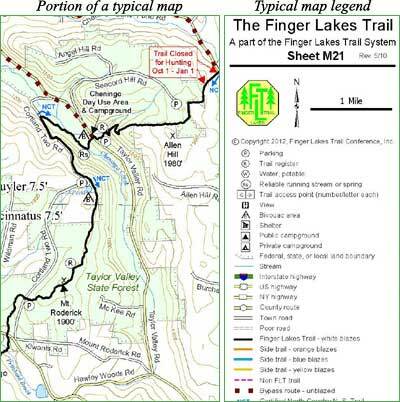 Because the various trails are described in the Cayuga Trails Club’s Guide to Trails of the Finger Lakes Region (2011) or, in the LLT’s case, is described above, only minimal directions will be provided here. Park at the upper (north) FLT trailhead on Daisy Hollow Road, near its junction with Carpenter Hill Road. Follow the white-blazed FLT for a mile to its junction with the Swedish Loop. Turn left on this blue-blazed trail; be sure to take in the scenic, short, yellow-blazed spur, Willa’s Vag, on the right, when you come to it. Continue on the SwLT until you reach the FLT again at its crossing of Bell-Hilsinger Road. Turn left and follow the FLT, eventually crossing Babcock Hollow Road and continuing until you hit the first junction with the yellow-blazed LLT. Turn left and follow this trail to where it splits, very close to Babcock Hollow Road. Continue on the yellow blazes by turning right and begin to climb through first red pines and then Norway spruces. Turn right when you hit the logging road and continue on the yellow blazes until you hit the FLT. Turn right on the FLT and follow it downhill, passing the first junction of the LLT once again. Stay on the FLT, recrossing Babcock Hollow Road, past Bell-Hilsinger Road and the SwLT junction again. Continue on the FLT uphill, passing the International Mine on the right. Go over the top of Owego Hill and then descend until you reach Owego Hill Road and the start of the orange-blazed Spanish Loop. Turn left on this road and follow the orange blazes to Adams Hill Road, where the blazes will turn off to the right on this lightly travelled paved road. After about a thousand feet of blazeless road the orange blazes will head off to the right and enter a field and then some evergreen woods. Keep on the orange blazes past several minor trail junctions and cross Daisy Hollow Road at a diagonal. Soon the orange blazes will end at the FLT. Turn right on the white blazes and follow them out to Daisy Hollow Road, after which you need to turn left on the road and follow the road 0.6 mile back to your car.